Non enveloped, icosahedral particles composed of 420 subunits with a T=7 symmetry. It has not been described whether handedness of capsid is laevo or dextro, here the pictures dsplays a laevo form. Monopartite, open circular, double stranded DNA of about 9 kb with discontinuities in both strands: one in the transcribed strand and one to three in the non-transcribed strand. Codes for 8 putative proteins. The 35s RNA and its spliced derivatives serves as polycistronic mRNA for viral proteins. Polycistronic translation depends on Tav which is believed to be a translation reinitiation factor. 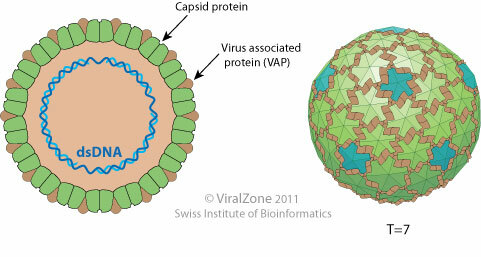 Tav is produced from the monocistronic 19S RNA, the second major viral transcript. Translation of 35S RNA is initiated by ribosome shunt, in which scanning ribosomes bypass leader sequence and multiple short ORFs.